Why yes, I AM still here, so glad you stopped by! Well. More like “ahead”, as it’s mostly hats with some neckwear, and “aneck” just doesn’t sound right. My knitting mojo seems to have decided to stick around long enough for me to actually finish something! 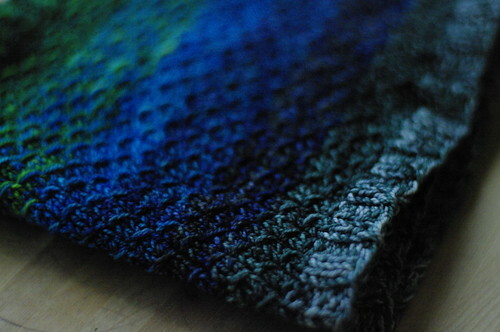 Way back in July, I cast on for Laura Chau’s Dipped Infinity Scarf, the yarn for which I got in a kit from Fibre Space. 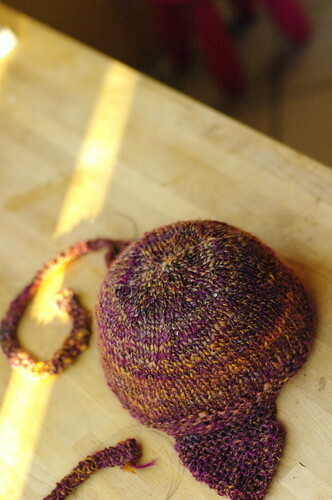 At the time, I, um, forgot the ribbing? Oops. I guess I was so thrilled at the idea of the color changes to come that I launched right into the stitching pattern sans ribbing. Anyway, I was so irritated with the mistake, and trying to decide how to fix it without ripping out what I already had done, that it took months for me to pick it back up again (kind of a metaphor for my life lately, actually). This week, after casting off (remembering the ribbing on this end) the majority of the piece, I figured out how to pick up stitches in ribbing on the cast-on edge, and only 5 rows later, there was a cowl! This is getting blocked today so the ribbing will quit folding over; had to stab a couple toothpicks into it to get it flat enough for glamour shots. 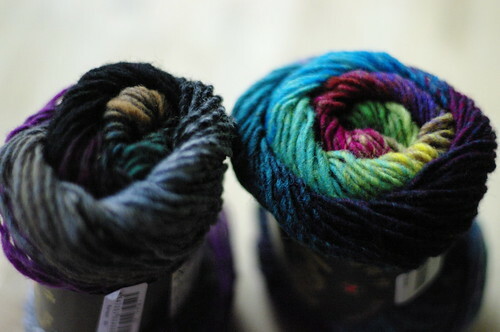 Notes: I have an unhealthy adoration for Karida Collins’ yarn, and there was no way I could pass up these colors. They just…glow. 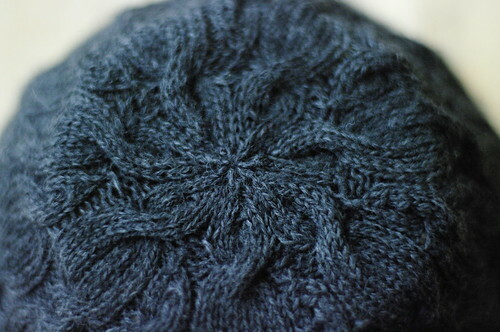 WHY I got stuck there is a mystery to me, though, because when I picked the project up out of hibernation, I picked right up where I left off & completed the hat with no difficulty. I don’t even know. The yarn is a grey baby alpaca I picked up at MDSW, and is as soft, fuzzy, light, & warm as you might expect, looking at it. Notes: dear self: you are not a failure as a knitter if you use a cable needle for 5-over-5 cable crosses, damn it, so STOP THAT & use the damn cable needle! Love, self. Where are you on your own color wheel? 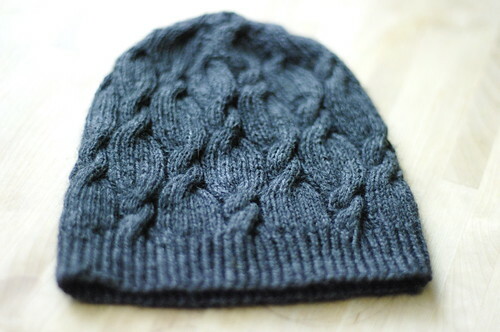 It’s possible that I am particularly knitstalgic at the moment, having finally imported ancient Typepad blog posts over that reach back to 2005. Certainly I was more clever in my blog headlines then, and FAR more prolific in my posts than the past ~mumble~ years have shown. 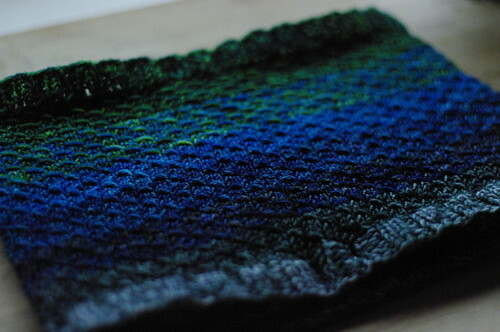 But to come across a pattern that was one of the first in what felt like a constant wave of projects that would zoom across the (then somewhat limited, compared to today’s 2m Ravelry users) knit-blog-osphere, trending as one of the current projects that knitters are into in 2013, feels almost like an out-of-body experience. Time traveling, if you will, but with more needles and fewer Daleks. 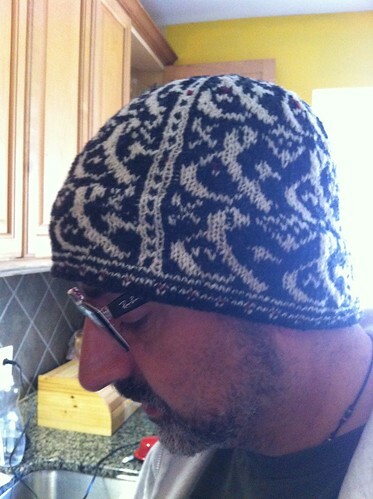 The Sainted Husband got his (almost)annual Crazy Hat Project result earlier this year – his Skully Hat remains the most oft-worn, beloved knitted item ever to come off my needles, so, as TSH is a professional editor and English teacher, I made him We Call Them Ampersands, a spin-off of the same pattern as his skully hat, now with more typography! Yarn: I don’t actually know. Generic shetland-esque wool I had in stash, no ballband. I don’t have a timeline for this one, either, I’m afraid. This is what happens when I don’t blog for forever; I have no digital memory to help me remember these things. 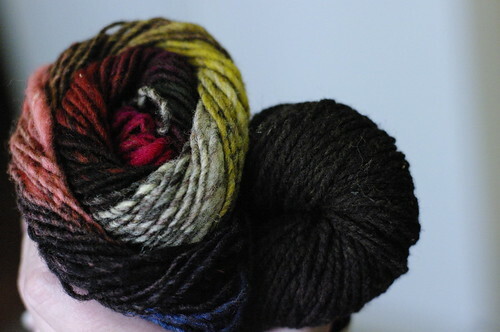 That’s Kuani for the color, and I think a shetland for the white. Pondering other options for this one. 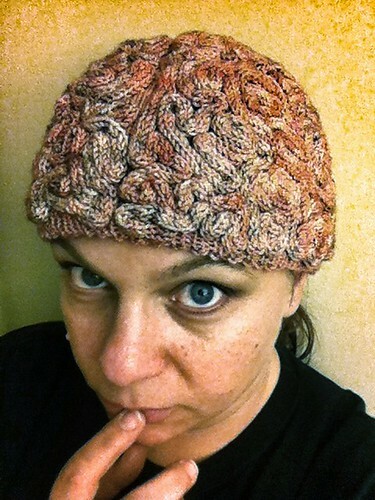 The other hat I knit last year ate up nearly all my knitting mojo, and it was a confluence of Twitter Bravado and commission. 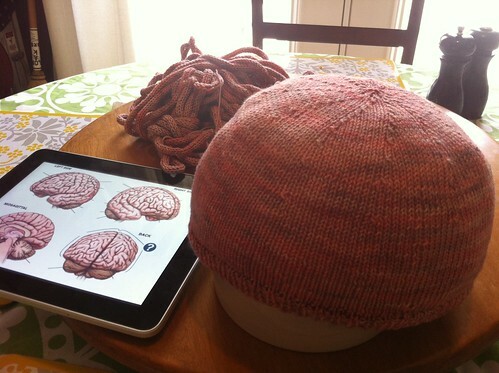 I follow many of the authors I love over on Twitter, and one day the infamous Brain Hat was mentioned as a desired object by one of my most fave authors. I, perhaps foolishly, replied that I had two sticks and some string and could probably make that happen. Several DMs later, I had a commission to make the thing. Needles: No idea. Addi, yes, but size? No clue. Completed: Sometime in March 2012. Not sure yet what that’s going to be. Holy crap you guys, there is so much. I shall sum up what remains in a forthcoming post. Meanwhile, tell me how y’all are doing? 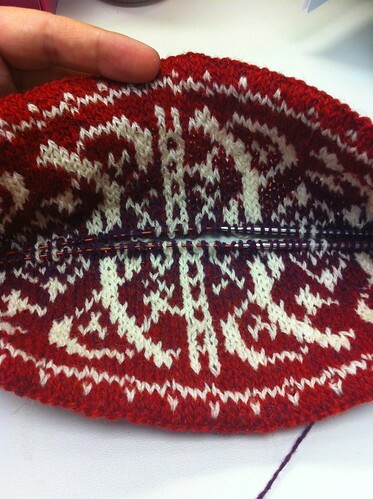 Here’s why it’s cheating: Because it’s been on the needles (or off the needles and in the despair pile) for…what? Two years? Maybe more? 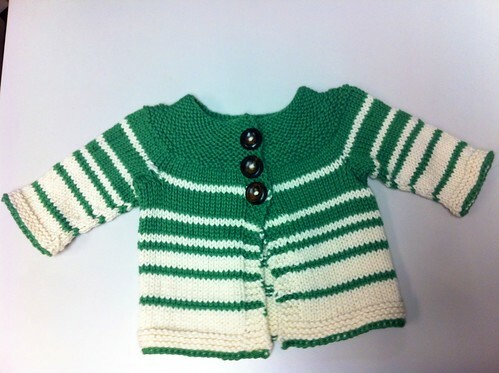 Y’all, I FINISHED THE RIBBY CARDI. 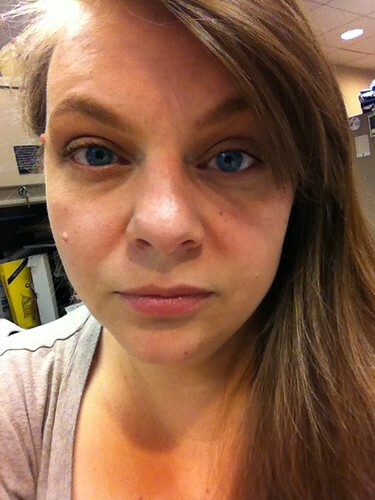 That, my friends, is the face of a woman who has discovered the difference a brutal blocking can make. 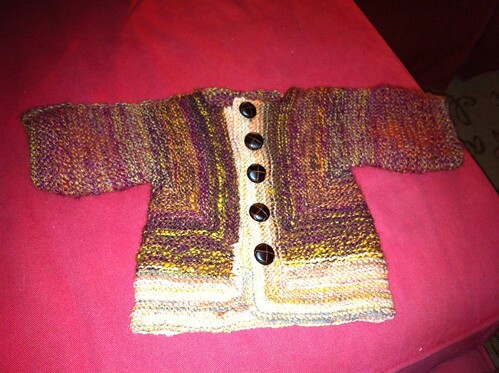 There are any number of things wrong with this sweater, since it was the first non-scarf item I ever cast-on for that wasn’t baby-sized, and because I was a new knitter who knew nothing at the time. But I’m going to ignore them all because it FITS and it’s warm and I love it as one can only love a first sweater that will see lots of wear. Forgive a) the house clutter I tried and failed to photoshop out, b) my personal dumpiness, and c) the foggy mirror of our marble-top. The edges aren’t quite as wonky as they appear there — I flipped back the side on your left there because I am so damn proud of the ribbon over the zipper tape on the inside. I followed Kathy’s fantastic zipper insertion method (oh the Google hits on THAT phraseology, I bet! 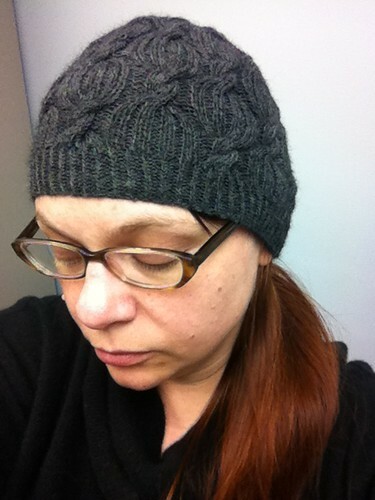 ), and the link on her blog to another blogger’s use of grograin ribbon over the zipper tape in lieu of knitting a zipper facing, and I am so tickled with the results! The ribbon was a happy marriage of browsing the fabric store and a sale. I am brainstorming what to do with the remaining 4-odd yards of the same ribbon, which I love despite it’s 80’s preppy overtones. Mods: I used one needle size throughout, and went up a size to get a slightly larger sweater to fit over the Bust of Dooooom. Notes: When I make another of these (and yes, there will have to be another, I think), I will want to make it longer — this one hits just at the top of my hips, and I prefer my sweaters to hit about mid-hip, so as not to get tugged every time I sit down and feel a draft in my lower back. Also, although I already learned this lesson from this sweater months ago, I won’t try to knit in my ends instead of weaving them in, as it makes fat wonky stitches for very noticeable bumps in an otherwise pleasing stretch of knitting. Also, I’d stitch the seams on a sewing machine next time, as my seaming skills are patently lacking. In the midst of the series of truly brutal thunderstorms we’ve been having here in Alexandria, Virginia and the D.C. environs, we had one lovely soft evening before the storms, so to speak, when we were visited by royalty. So that was a lovely little interlude. This is the semi-sheer overlay that’s used to help you place applique pieces in the right spot as you stitch over time; generally, when using somebody else’s patterns, you would trace the pattern directly onto this gridded stuff, which I think masquerades as interfacing at various fabric stores like Hancock’s and JoAnn’s, et al. That’s the Dove from Noah’s Ark, presenting his Olive Branch, and surrounded by a lyre-type wreath of olive leaves and branches. This is a peacock, in case it’s difficult to tell. 🙂 I love the way mom stitched the feathers on this one, but have to say that the actual block design does very little for me. This is the very incomplete Tree of Life block; I love her fabric choice for the bark, however, and the varied greens she chose for the leaves. Those are the blocks that she did not set up to do "quilt-as-you-go" before she passed away; I have two more amazing blocks of mom’s to show you another day, that she managed to get quilted, or prep for quilting, that show very well both her own stitch artistry and also the steps taken to get to a completed quilt, block, or what have you. And I have the picture of my first sailing ship block, and a huge quilt project I am going to undertake to tell you about. So, stay tuned! First and foremost, I give you my long-traveled and most wonderously beauteous Sockapaloooza Socks, knit for me by Kimberly of A Knitted Frenzy! Pay no attention to the terrible night-time-is-the-only-time-I-have-time-to-take-photos, photos; they fit perfectly, are of one of my favorite yarns (Lorna’s Laces Shepherd Sock, Cranberries), and in a pattern I’d tried myself in the aforementioned Socks That Rock yarn that I thought I didn’t like. More on that in a moment. These are the Nancy Bush Child’s First Socks pattern from her Knitting Vintage Socks book, which I am utterly addicted to. My own pal’s socks were a pattern from the same book. This is Mohair roving from Persimmon Tree Farm, owned by Greta Dise. (The Farm, not the roving in these photos. 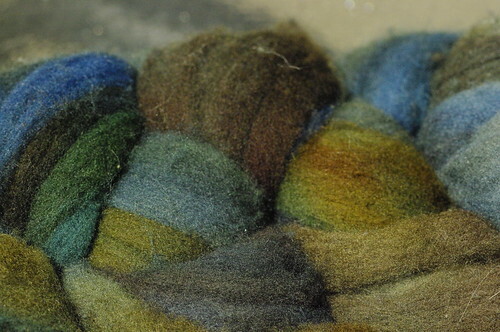 :)) I love it — these two photos are of the same ball of roving, but different sides. It’s called Fall Harvest, and I got the same stuff last year with glitz in it. 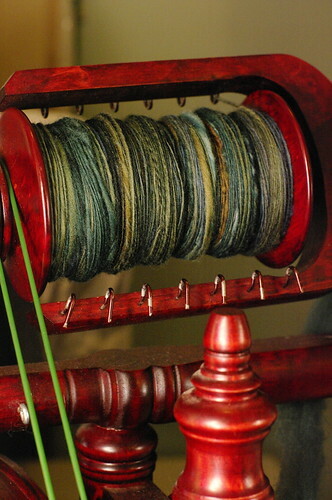 I have grandiose notions of one day getting myself a spinning wheel and plying the non-glitz with the glitz. But then, ALL my notions tend towards the grandiose. Sheila? That’s the Falklands wool you sent me that I was gushing about in a previous post. It’s SO lovely! This wee ball is all I could get on the spindle before it started to bobble, so I think I’ve a ways to go to learn about wrapping the shaft properly as I wind on. These jaywalkers are my first try at a picot edge, and I have to say that I am so in love with it! I especially love the way they make little crenellations like the wall of a castle. 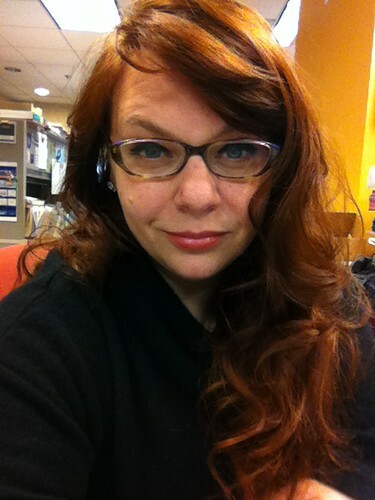 I showed them to TSH, and referred to them in that conversation as "dits". He asked what a dit was, and I said, THOSE!